If you’re a fast-growth online retailer, it’s easy to get buried under the weight of paper-based manual processes when fulfiling more and more customer orders. Ironically the growth and success businesses experience also presents challenges in doing business with customers and partners throughout the supply chain. At Vision33 we’re aware of the types of challenges facing small to midsized enterprises (SMEs) as they are faced with business system challenges that hinder order fulfillment and conducting business with suppliers, vendors, and customers in their supply chain. EDI holds the key – read on to learn why this technology is integral for online retailers. Redundant keying, duplicate entries, and incompatible applications can all lead to inefficiencies and delays in your supply chain. 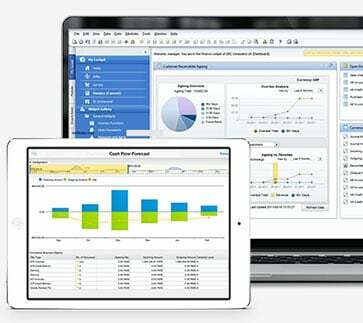 The challenge lies in the breaks in workflows between their business management system and trading partners. That’s where EDI technology comes in. EDI replaces order processes, transactions, and communications that were done with paper or fax in the past. But what exactly is it? EDI stands for Electronic data interchange. It allows you to send information digitally from your business system to another in the supply chain using a common language. 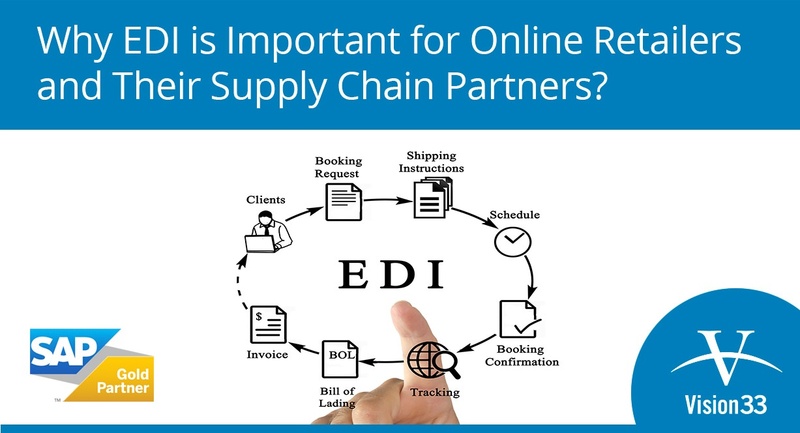 So, EDI is about data transmission and the translation of that data to a compatible format to work with the systems of your partners in the supply chain. With data transmitted digitally, users can expect a decrease in manual paper-based processes and a reducing in data entry errors and facilitate the ease of partnering with businesses in your supply chain. If you’re using an integrated enterprise resource planning solution like SAP Business One, Vision33 offers a EDI solution to integrate your system with over 55,000 retailers, manufacturers, suppliers, and 3PLs around the world in the SPS Universal Network. SPS Commerce Cloud EDI is a retail trade supply chain connector that helps standardise electronic data interchange (EDI) transactions. From Advance Ship Notice, Functional Acknowledgement, Inventory Inquiry, Purchase Orders, and more there are many types of EDI transactions. They’re used to standardise information exchanged throughout the supply chain for several reasons. SPS Commerce Cloud EDI – powered by zedSuite provides the deepest level of integration between SAP Business One and your trading partners’ capabilities not available from any other product. Benefit from a single solution that seamlessly merges and manages your key business processes to meet your trading partners’ specific EDI requirements. Learn more about the benefits of SPS Commerce Cloud EDI. Discover how companies can streamline their retail supply chain with standardised EDI technology.